Bummed out? Ticked off? Hemmed in? Tied down? Choked up? Take this book and write it down, then tear it up, or soak it in water, or burn it. And let it go! Let It Go helps get rid of those negative feelings to make room for what makes us happier, healthier, wealthier, and wiser. It's elemental -- in order to give up bad habits for more healthy ones, we need to let go. Let It Go uses simple, fun rituals involving the four elements -- fire, water, air, earth -- to render negative issues harmless by altering them and releasing them forever. 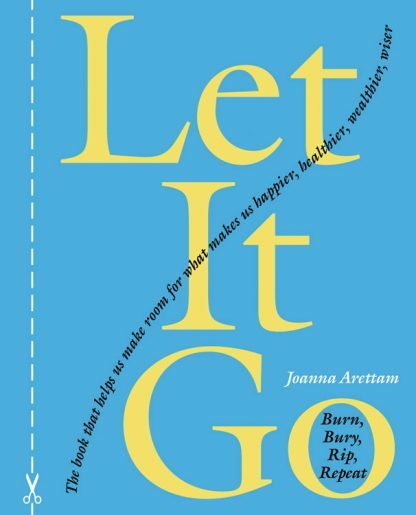 Let It Go is a simple book with a profound message and a unique format. Joanna Arettam helps readers identify the enemies they wish to vanquish. Through examples, exercises, anecdotes, and inspirational quotes, she gives us permission to let go of what's holding us back. Transformation is the theme of part two. In the back of the book are perforated pages called "Contracts for Transformation." Write down what we wish to let go of, how we wish to transform it. But writing is just the beginning. Tear these pages out of the book and burn, bury, soak, or scatter them. The physical world can absorb those negatives and transform them into positives. For example, let go of anger by writing a list of things that makes you see red on a "Contract with Earth." Bury the contract in a pot of loamy soil and into that small vessel of earth place seeds of a plant that will grow to yield a beautiful crimson flower! Joanna Arettam is a painter and writer who writes widely on lifestyle, self-help, and spirituality matters. She was formerly an editor at Glamour magazine. She is the author of Dharma Beads.